Silo clock cast attractive shadows on the wall whilst performing gentle movements. Just like time itself this clock never feels the same every time you look at it . A beautiful piece of statement aim to portray time with a poetic sense. Silo is more than a clock, it is a compact sculpture that you can hang on your wall and stare at everyday. It changes at every instant showing you the time passing, always in anew, wonderful way.
" We try to reduce each object to its bare minimal and see what’s left, and from there we start to add some emotional touches "
Cantili is a tape dispenser with a pared- down, sculptural form abstracted from the everyday tape dispenser. Consisting of a pair of concave circles and a cantilever, its simple and light design is stable enough to be used with single hand. Funno is a pencil sharpener machined from a solid block of metal and hand polished with mirror finish in various colours. 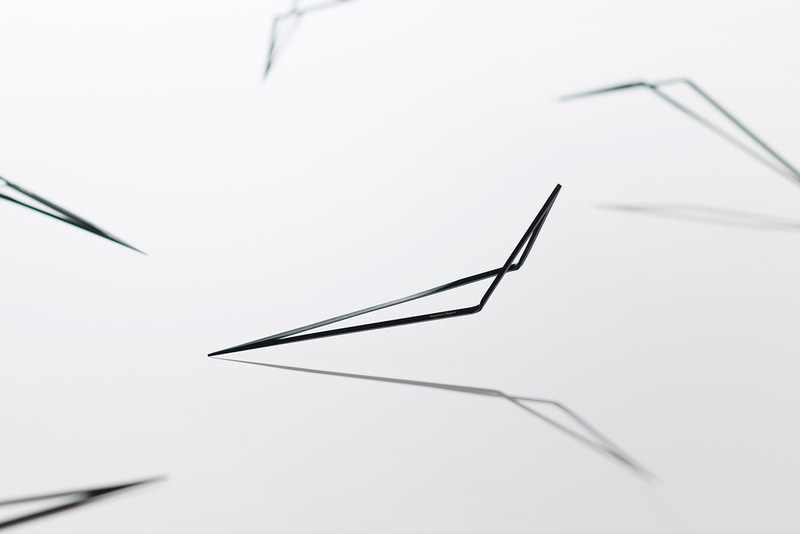 Funno also works as a beautiful paperweight ‒ a still yet dynamic sculpture on your desktop. Penpo is not an ordinary desk organizer, but a micro architecture built on your desktop. Three tubes of different materials, height and sizes with magnetic joints form a playful combination while providing maximum flexibility. 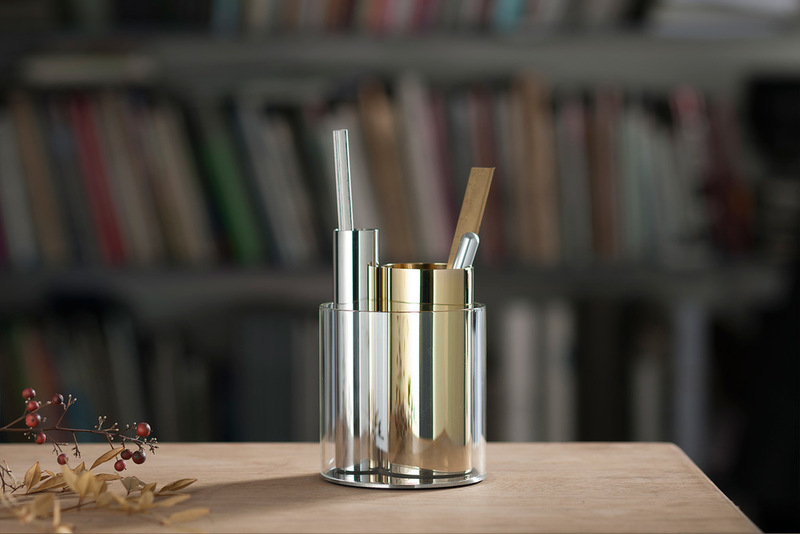 With Penpo, pens, pencils and other desks tools can be tidied with elegance and style. Align's minimal pen body is divided into three parts, where the middle part is dislocated when the pen is closed. To use the pen you simply need to twist the pen to align the middle part with the rest of the body, the pen tip will be pushed out following the alignment. Simplicity, quality, function and innovation have been the central tenets during the design process throughout this project. We wanted to break away from the standards in the pen market while achieving a high end device at an affordable price. The mechanism we designed for this pen is completely unique, yet intuitive and reliable. We wanted to transcend the classical twisting or clicking mechanisms by developing this precise and user friendly piece of engineering. "Only when the technology is invisible is it of any use." The design of Empty Memory was considered as "micro sculpture" or "micro architecture". The form no longer contains a micro chip or circular board, it contains a invisible space that links to your memory. "We want to make a tool for writing instead of another gadget." We wanted to make the pen as simple as possible. We therefore combined the retractable stylus with the refill end cap. The outcome is a simple yet effective mechanism that allows for easy refill together with a stylus that can seamlessly retract back into the body of the pen. We build this pen around the Schmidt Fineliner Refill. The result is a Long lasting smooth flow pen with quick dry water-based ink and spring loaded tip; an incredibly versatile pen, perfect for sketching and note taking. "The hidden harmony is better than the obvious." The design process is not about creating a solid shape, but to eliminate the physical trace of the candle holder, giving stage to the space, the light and the candles. It is not about the form, it is all about the candle arrangement within the space. Avani candle holders can also be paired together to create a more complex interlinking structure. Beautiful from every perspective, Avani is a geometrical candle chandelier made up of an angled wire structure. Manufactured using a wire bending technique, it comes in four finishes; black, gold, silver and copper. Elegant, intricate and attractive, Avani is a show piece ornament for any home.